Can be installed in minutes and used immediately. No wait for sealants to cure. And it won't leak again. Simple as that. Below is a quick view of the installation and more detailed slides. Consult our FAQ section for more answers. Make sure surface is clean. Align the adapter, o-ring down. The above slides demonstrate step by step how it's done. 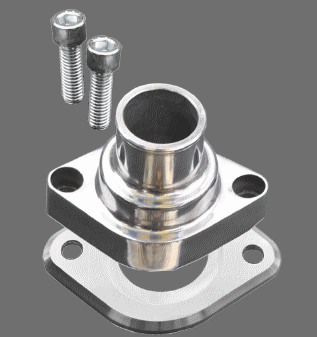 Thermostat Housing Adapter KIT includes thermostat housing with o-ring and adapter with o-ring and 2 bolts. (Thermostat NOT INCLUDED). 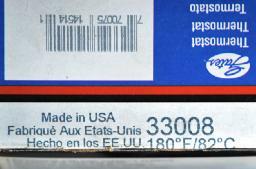 Common thermostat, for example: 180°F/82°C temperature, Gates #33008 (fits 1980 and newer Chrysler V8s, and most 1955 and newer Chevy V8s). Thermostat Housing Adapter KIT includes thermostat housing with o-ring and adapter (also) with o-ring, and 2 bolts. Check quantity before checking out.